I listened to my friend Kim talk for about an hour this morning about one of those major dilemmas we all face occasionally. Not that you or I have ever faced the exact same dilemma she is up against this morning, just that we all face cruddy situations of one sort or another. It's one of those tough spots that you can't get out of by just blinking three times or shooing it away with a wave of your hand. It's going to take some open communication (makes me shake in my mules! ), some tough love, a few new boundaries, a little hard work, and, heaven forbid, time. Don't you just hate it when you find yourself smack dab in the middle of one of those sticky situations that quite honestly you didn't cause or invite, but you have to help clean up? So Kim griped and complained poured out her heart and vented her frustrations to me for a while and I gave her my opinion my attentive ear and shared my three step plan for how to solve it all her burden with sympathy and compassion. Because that's what good friends do. And I am nothing if not a good friend! Then, as the conversation lifted and I could tell (even over the 900 miles our phone conversation was spanning) that Kim was beginning to get a grip a little perspective, she said with a little more cheer in her voice, "Isn't it funny how the little things can make you feel so happy even when other things are bringing you down?" Yes, yes, I thought, I'm sure a simple conversation with her best friend has indeed made Kim feel so much better. I wouldn't call myself a "little thing," but hey who's getting hung up on word choice? I knew she meant that the hour spent on the phone with me had really ministered to her spirit and restored her joy. 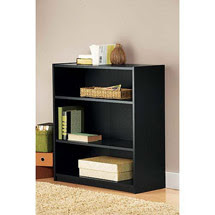 Kim continued, "This little book shelf that I put together this week just makes me so happy!" Then I remembered my very sanguine friend telling me about how over the course of two nights she had assembled a very simple book shelf from Walmart so she'd have somewhere to put all of her books. Now Kim is not a big reader, but she has recently finished her masters degree in counseling and become a licensed Christian counselor and has thus begun collecting a number of resources to recommend to and work through with her clients. So, needing a place to put all of these new books, Kim bought a shelfing unit. Then she proceeded to refuse her husband's offer to put the book shelf together and insisted that she assemble it by herself. Did I mention that Kim is quite sanguine? I don't know if she thought the shelf was a party-in-a-box or what, but she was definitely out of her league. On Monday night she stomped away from the partially assembled shelf in disgust. Obviously it was not talking back to her. The next day she finished the shelf with pieces to spare. And now she was telling me, the friend who had listened and advised sympathized, that this little shelf was "making her happy." Go figure. "I look at that little shelf and all of my books are on it so nicely. It makes me feel like everything is where it should be, like I have a little order in the chaos. It just makes me feel happy." I get that. Do you? Indeed, during our dark moments, our times of confusion, those days when nothing is going right, our tough times, it is often the littlest things that can lift our spirits and make us happy, even if only for a moment. Little beacons of light that remind us that all is not lost, this isn't quite as big or bad as you think it is, and, hey, at least your books are on a shelf! I took a look at my bloggy friend Carpool Queen's blog before I started writing this post and turns out she's having a fun give-away if you can tell her "what makes you feel skippy." That's her term for happy. I entered and you ought to too.Chick-fil-a gift cards are a good incentive to head over there. But before you do, I too would like to know what little things make you happy. I'll list a few of mine and then you do tell! I love it when all of the things I'm making for dinner come out of the oven, microwave, stovetop, etc. at the same time. It makes me happy when my daughter calls me Mommy - she's 16 and that's still her name of choice for me. It made me really happy when I bought a pair of $78 pants from Ann Taylor (not Loft) last summer for $5.25. I bet that would make you happy too! A clean house makes me very skippy. My parents coming for a visit perhaps makes me the skippiest of all (hint, hint). So what about you? When you're in the middle of dealing with a dilemma or toughing it through another hard day or just dealing with the stuff of life, what breaks through the barrier and "makes you happy?" Comments are still counting toward the big 100th blog post giveaway - so post away! And have a great weekend everyone! You bless me!